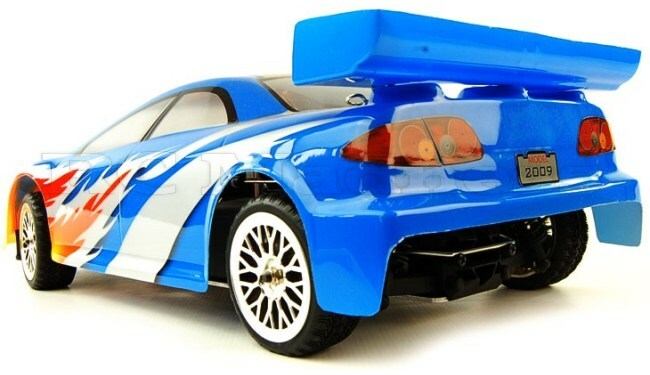 This Is One Fantastic Nitro RC Car! 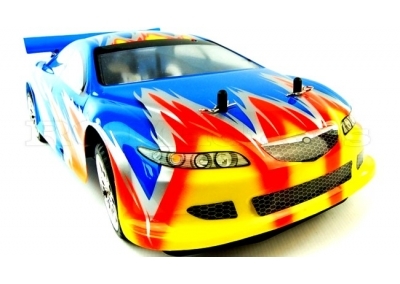 This Top Of The Range Pro Race Car Has A Massively Powerful 18CXP SH Branded Engine! Instead of the ordinary 12cxp or 15cxp. This Combined With The Revolutionary Hi Speed Transmission Gives This Car A Blistering Speed of 60mph! 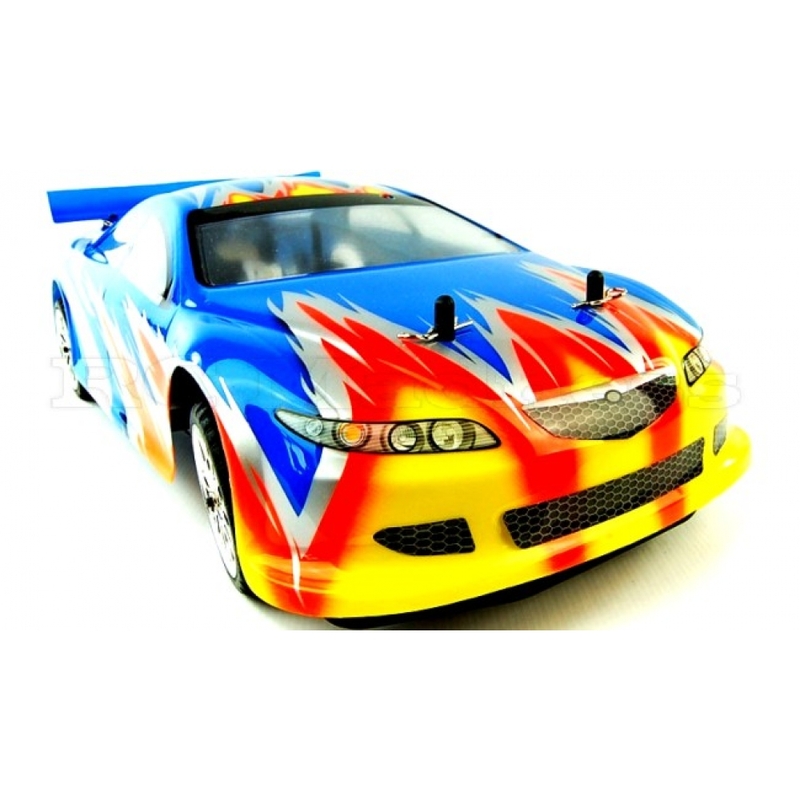 These cars come fully assembled and ready to run with pre-painted body shells with fitted stickers. 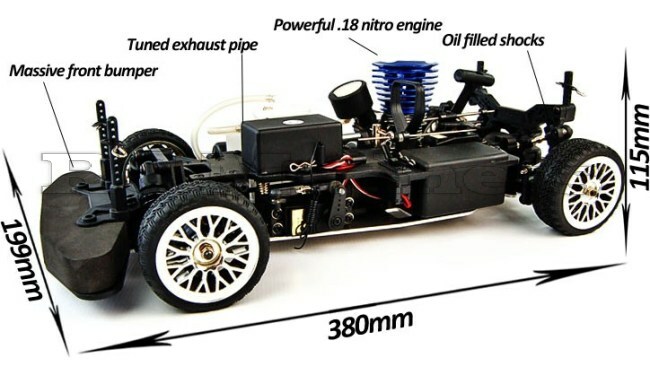 This Fantastic Nitro RC Car has adjustable shock absorbers! So you can easily adjust the suspension stiffness for a white knuckled race feel or a smoother softer setting for rougher surfaces. 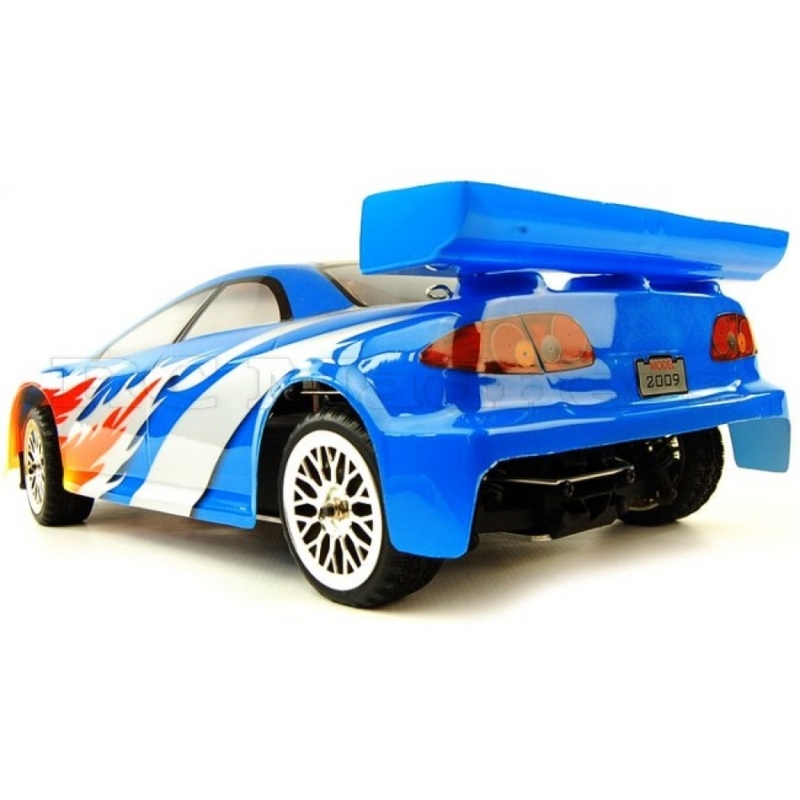 These fantastic high performance vehicles have ultra rigid duel layer alloy chassis which ensure maximum stability, grip and strength for high speed racing and huge drifts. Please note: The video below is of the old Himoto subaru. 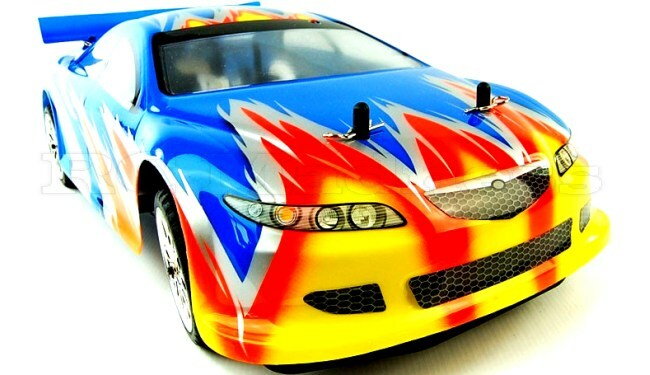 These nitro race cars boast the high build quality of all ACME models, with a strong alloy chassis, shaft driven four wheel drive system and sealed radio compartments. The oil filled alloy capped high performance shock absorbers, combined with the high speed progressive springs ensure maximum grip on any terrain. Front and rear sprung bumpers provide fantastic protection while the strengthened duel layer chassis and shock towers provide maximum strength. the air, while the rear wing keeps the rear end planted through the turns. 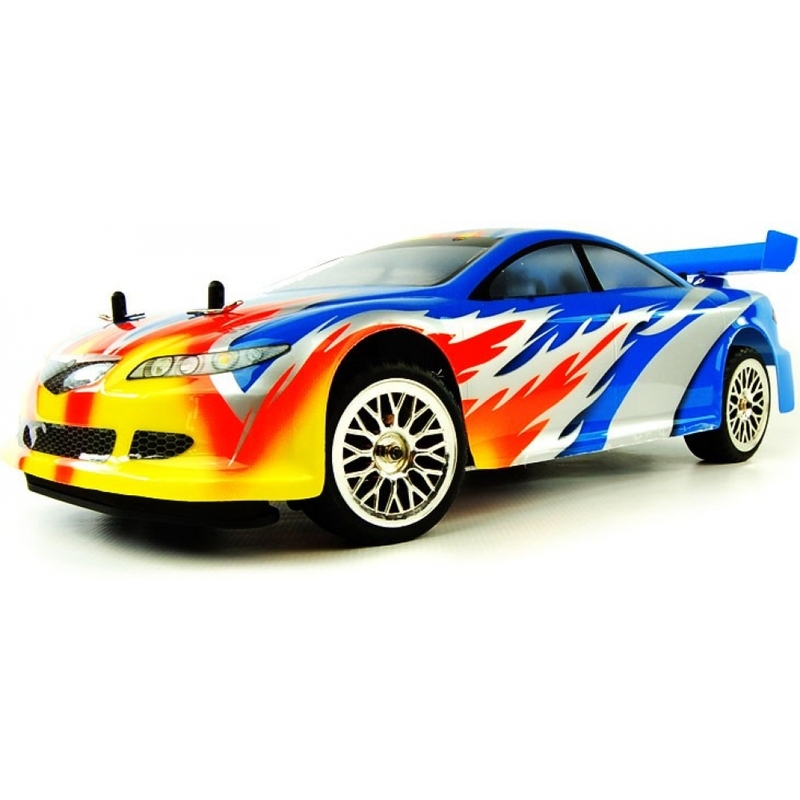 This fantastic nitro radio controlled car has a High Speed Ratio transmission to reach the highest speeds possible. Foam filed rubber Grip tyres provide fantastic traction. Huge 18CXP Engine Provides Insane Acceleration And Speed! Equipped with the new 2.4ghz crystal-free high performance easy to use radio system allows up to 27 cars to race together all at the same time without changing frequencies. 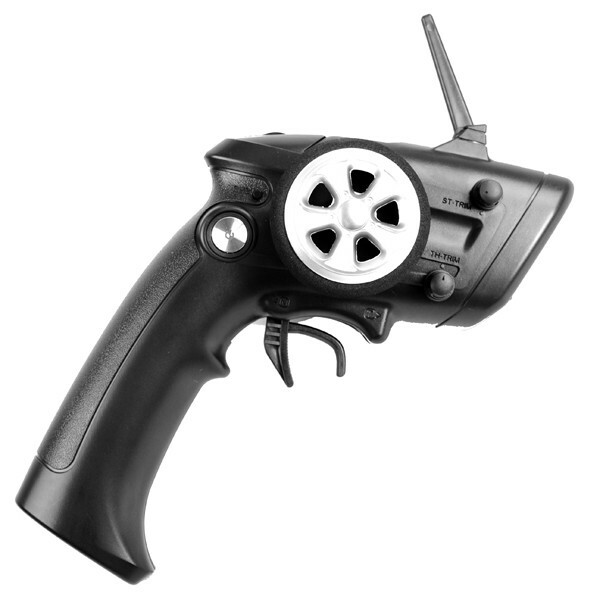 The high quality easy to use pistol-grip transmitter gives ultra responsive control and extended range (up to 100 Meters). 2.4Ghz receiver has a built in fail-safe, so if the batteries run out of power when you are driving, the car will automatically stop. So what are you waiting for! 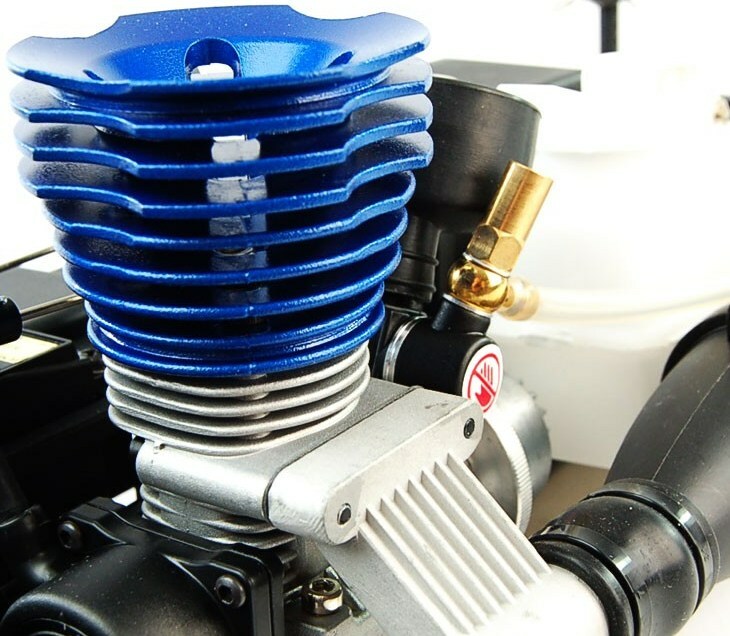 just add nitro fuel, batteries and a glow starter kit and prepare for some serious racing and drifting fun. Acme 60MPH 4x4 Professional Nitro RC Race Car. (Optional) Nitro Glow Starter Kit. (Optional) 4 x AA Batteries (for car). (Optional) 4 x AAA Batteries (for transmitter). Nitro Car Fuel (Sold As Optional Extra). Glow Plug Starter Heater (Sold As Optional Extra In Starter Kit). 4 x AAA Batteries For The Remote Control (Sold As Optional Extra). 4 x AA Batteries For The Car (Sold As Optional Extra).